Recently we sold our house. Don't worry, we're not homeless. We bought another. We went from a three bedroom to a four bedroom home. It has been a great move. The children once again have a bedroom all their own. It did come with one slight draw back. We were short a dresser. Three children but only two dressers. The girls were sharing a dresser because we just didn't have enough space for a third. That situation has changed and it is time to remedy it. Their were a few things I did not have time to go over in the video. 1. When measuring for the dadoes that I routed in the sides of the base unit to accept the divider frames I realized I could use my table saw rip fence alignment jig. 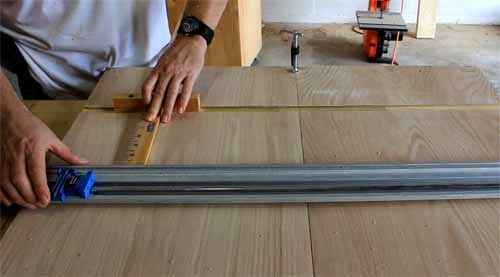 Because the dadoes were three quarters of an inch and the jig is also three quarters of an inch it fit nicely in each groove to measure for the next dado. I ran the alignment jig along the top edge of the sides to measure for the first dado to be cut. I had never thought of doing this in the past and I'm not sure why I thought of it in this instance but I'm glad I did. 4. 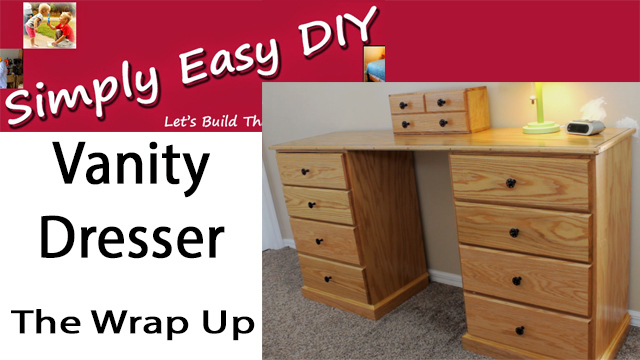 Part 2 of the DIY vanity dresser build will focus on the drawers and I will do a complete walk through of the process I use for squaring up stock that I cut to rough length on the miter saw. Today's video is a little bit longer than I normally do, So I'm going to get right into it. I'm going to build a vanity dresser and today is going to be the base units. Now this is going to be a birthday present so, lets do a good job. I'm going to start by ripping the sides pieces to width on the table saw. This is going to be a rather large piece of furniture. A vanity dresser is nothing to sneeze at however, just because it is one large piece, doesn't mean you have to build it in one...large...piece. smaller components and then deal with those components individually. Vanity dressers usually have to separated base units so that you can sit between them. So in this video I'm going to build the two base units. Then I'll cut them to length with the circular saw. To help minimize the tear out when using a circular saw I like to place blue tape on the cut line. I also find if I slow down when making the cut it comes out a lot cleaner as well. drawer divider frames so I'll route the dadoes for those now. However, I don't feel they would be an essential aspect of the design. In fact, some would argue they just take up space. I think there are merits to both sides. Again we come back to that running theme here which is find something that works for you and that you are comfortable with. So after I'm done with routing the dadoes for the frames I'll route the rabbet for the back panel. I'll stop short of taking that the length of the side as the panel doesn't need to go all the way to the floor. Now it's time to build those divider frames I mentioned just a moment ago. I have here a piece of one by four oak. I'm only going to use this for the front of the frames. I also don't need 3.5 inches for the front, so I'll rip those pieces in half on the table saw. Assemble the frames using pocket holes. Alright so now I have all of the frames assembled. Time to turn my attention to the back panel. I'm cutting this free hand because I got skill. Actually I'm just to lazy to set up the straight edge. The first makes me look better than the second. Success, all the pieces are cut and I'm ready for assembly. Yep this is the part where you realize you didn't cut something right and you can't fix it, you have to start all over. Ok, now don't tell me I'm the only one who has those dreams! Now fit the other side. While that is drying, I'll start cutting the pieces for the drawers. I'll square everything in just a moment. To square these pieces, I'll make a pass on one side of the board without the stop block that you see here. Then set the stop to the final measurement I need and cut the other side of each board. The battery on the camera died so your only seeing the second part of the process. Then just take a moment to make sure everything is good to go. After I have all the sides cut to width, length and squared, I'll go back to the base units and remove the clamps. Put those back where they go. Grab my brad nailer while I'm in here and tack in place. Once the back panel is in place, I'll set the unit on the floor and attach some cross braces to help support the top of the dresser. Lift the Vanity dresser back on my table and apply some edge banding. Alright I have both base cabinets built and they are looking pretty good. I think next time I'll start building the drawers and maybe start staining. Hey, thanks for watching, subscribe if you haven't. Check me out of Facebook and Pinterest. If you like this video, here is a couple more you'll like as well. Do you have plans for this? This is exactly what I would like to build for my wofe. I cannot seem to find part 3 except on youtube. Am I missing something? Hmm...I have been redesigning and updating the website tonight and it seems I may have lost part 3 somehow. Are you looking for the design plans? I can email you a pdf copy if you send me an email. I like how you put your video with the build. Could you please send me the plans for this.